Whisk, blend and chop all in one. 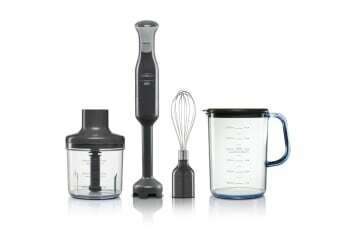 Whisk, blend and chop all in one, with the Sunbeam StickMaster Plus! Take the hassle out of kitchen prep with this amazing StickMaster Plus and enjoy perfectly prepared ingredients in minutes. With a simple twist and lock design, you can easily attach the powerful wand to the attachments to power through any kitchen prep in no time at all! Whisk liquids in the convenient measuring jug or use the processing bowl to make delicious crumbs and doughs. With incredible horizontal and vertical blades, the StickMaster Plus also perfectly slices and blends your ingredients exactly the way you want them.